B+W Black & White filters, as the name suggests, are mainly used in black and white photography. 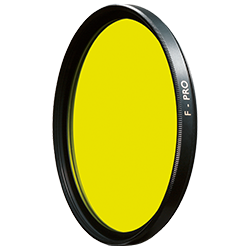 Yellow filters, for example, can help to add more brilliance to landscape photos and to differentiate the greens in plants and foliage. Yellow and orange filters can conjure clouds out of mere cloudlets, while red filters can increase them to dramatic storm strength or create moonlight effects in daylight. The contrast can be increased in a digital camera by taking the picture directly in the black and white mode. The B+W 022 yellow filter 495 is regarded as the basic filter for every black and white photographer. A cloudy sky looks very natural, but is not yet dramatic. Long-distance views with a light haze become clearer – an ideal filter, especially for landscapes and photos of plants. 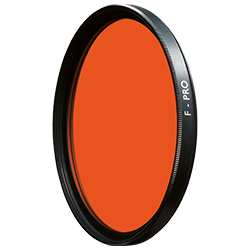 The B+W 040 Orange Filter 550 already has a very pronounced effect and darkens violet and blue very strongly, green quite strongly, and even yellowish green a little. Landscape and architectural photos show an increased, almost "graphic" contrast, while a cloudy sky may already appear dramatic. The traditional B+W 090 light red filter used for architecture. White façades are lightened, blue skies are dramatically darkened, and clouds pop. Also used for spectacular landscape photos with greatly improved views into the distance and for posterization (tonal separation) in photos of objects (blue and green very dark, red light). Compared with the lighter B+W 090 red filter 590 described earlier, the B+W 091 red filter 630 delivers a further intensification because it even darkens the yellow close to red in the spectrum, and its transparency does not come into play until the orange-red zone. It produces dramatic effects and extreme posterization for a graphic effect.